Much has been written about the overwhelming preponderance of Argentine air power over the British Task Force. At the start of the campaign it seemed to the services and commentators involved that Argentina’s air assets were fearsomely large. Yet in the `true’ light of battle their much vaunted strength now seems somewhat illusory. Argentina’s aircraft did indeed pose the greatest threat to British ambitions in the war. 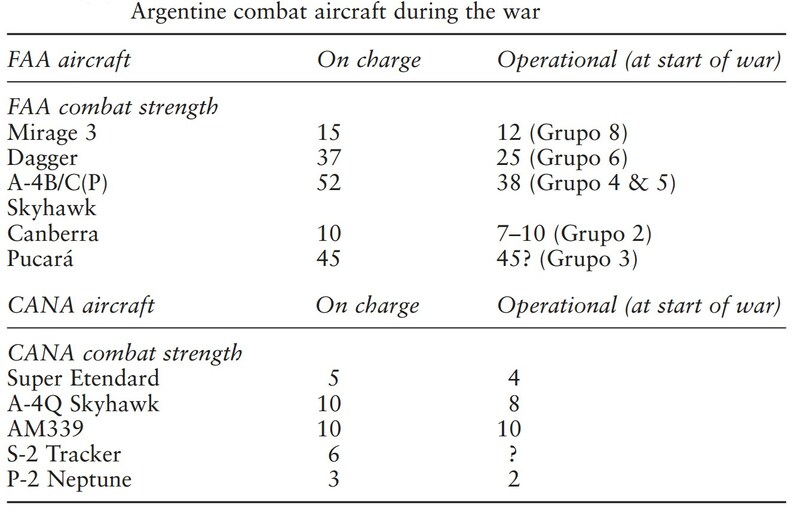 The numbers contained within the ranks of the Argentine air services dwarfed those in the Task Force, and the Argentine pilots were just as accomplished and well-motivated as their British counterparts. However, less well known to the British were the problems the South American nation faced with its air services. Initially, much of the knowledge of the air threat to the RN came from shipboard sources, secondhand information and weapons suppliers. Accurate intelligence was in fact woefully lacking in the Task Force, forcing the realisation amongst many that Britain’s air strength faced a serious uphill struggle in all respects. At the outbreak of hostilities Argentina possessed the combat aircraft, but as can be seen, far from all would be operational. Aircraft at the start of the campaign ranged from being in active squadron service to undergoing long-term maintenance or being used as a source of spares for other machines. Besides availability issues, Argentina had other problems. The Daggers of the FAA, for instance, had been only recently delivered from Israel and pilots were still `working up’ on the air-craft, resulting in the Dagger’s potential not being fully realised or understood. The same was true for the CANA with their Super Etendards and AM339s, both of which had been delivered only the year before. Impressive as the size of the force might be compared to Britain’s seagoing combat strength, there were other important shortfalls. 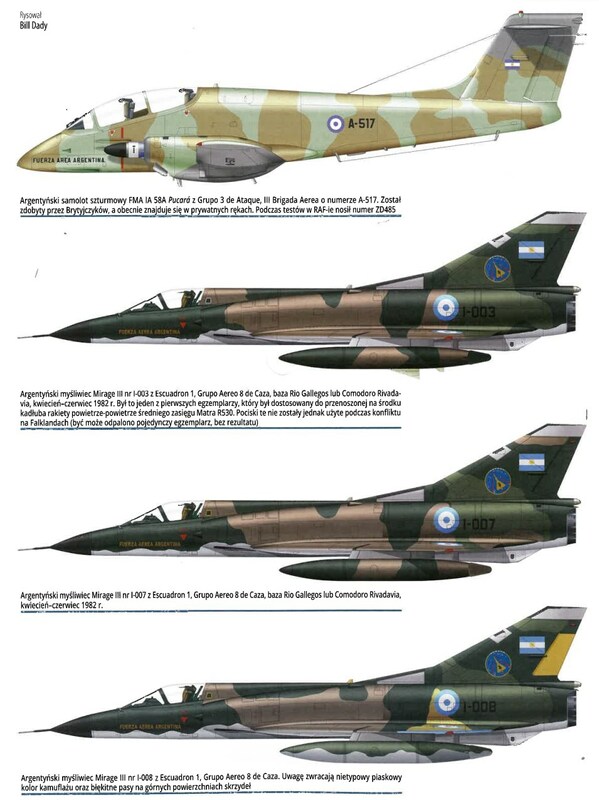 Argentina’s true air defence capability rested with only a dozen or so Mirage 3 fighters. 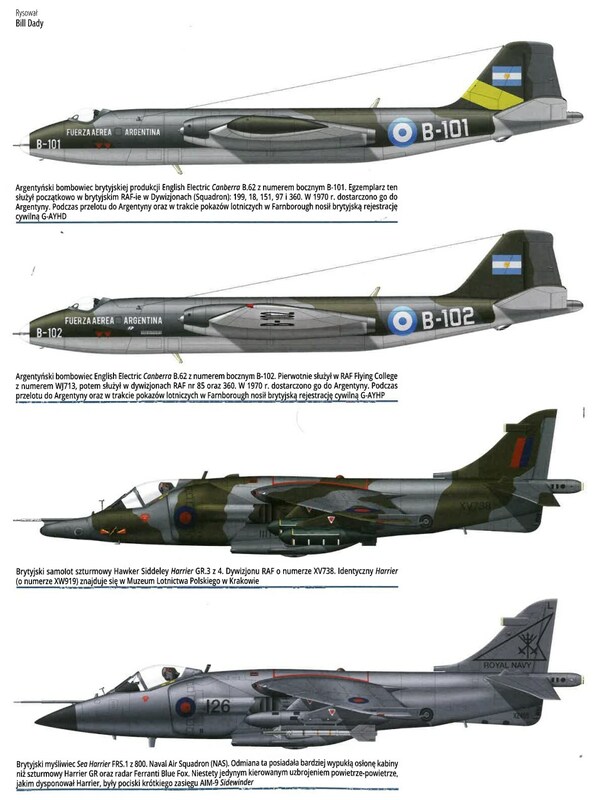 Aircraft that would be required not only to engage and defeat the Sea Harrier for air control but also defend Argentina’s air space from possible British or even Chilean incursions. Thus the RN with its initial 20 Sea Harriers actually had more dedicated fighters in theatre than Argentina, and this was a position which would not alter for the duration of the war. In fact, the bulk of Argentine air power was concerned with the delivery of ordnance, although there were limitations here as well. One happened to be the inexperience of attacking ships by the FAA pilots. CANA pilots were obviously well versed in anti-shipping strikes but their land-based counterparts were not. To compensate for this an intensive crash course run by CANA personnel was given to AA pilots at the start of the campaign and ultimately proved to be very successful. Notwithstanding attack problems, range was perhaps the most important problem. Argentina’s long-range bombing force consisted of some ten operational Canberras. The majority of their aircraft were shortrange machines and during the campaign these would be operating at the limit of their endurance. The range of quite a few aircraft types, but not all, could be extended by AAR using a pair of Hercules tankers, but in the end just two tankers would be of limited use. 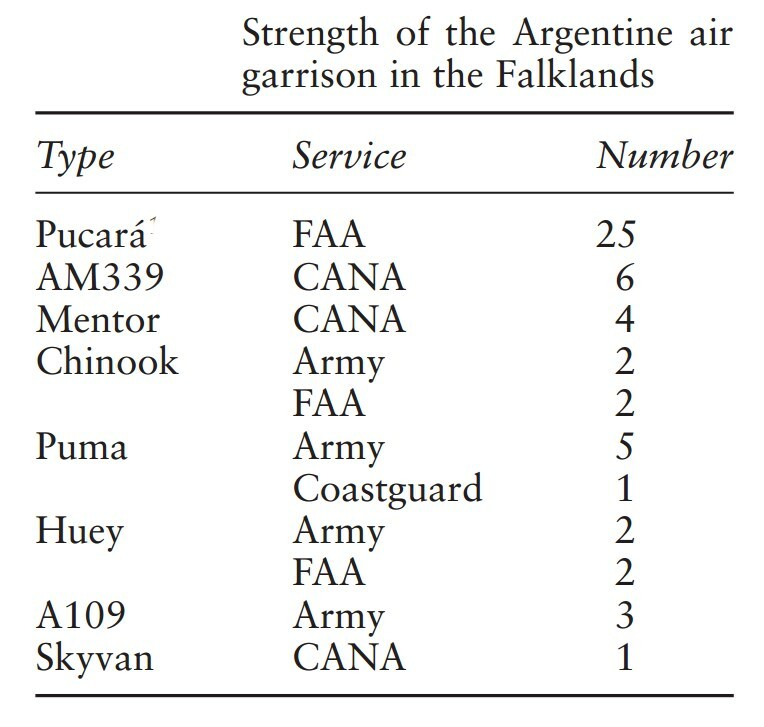 Consequently, the bulk of the Argentine aircraft had very little time on station over the Falkland Islands. This would force Argentina’s pilots into using some very unfortunate tactics. In the battle for air superiority the Mirage 3 was forced by lack of fuel to engage the Sea Harriers at high altitude, an altitude where the Sea Harriers were simply not going to roam. Without large-scale air-to-air engagements between the two main air defence assets the Argentinians effectively gave an element of air control directly to the British at the start of the campaign, without even a shot being fired. In the anti-shipping role, Argentine pilots were obliged to attack the first ships they encountered. They had very little choice as loiter time and slow selection of targets was not an option, owing to British air defences and lack of fuel, forcing them to attack British warships rather than the more valuable amphibious ships and STUFT. There were deficiencies in other areas as well, most notably in maritime reconnaissance and AEW. However, the FAA and CANA adopted ingenious solutions to these problems such as using transports, propeller and jetliner, to shadow the Task Force. But one area where the Argentine air services proved more than capable was the air-bridge between the contested islands and the mainland. Argentina quickly exploited the use of aircraft for transport in the early days of occupation. In April alone military and civilian aircraft carried into Stanley more than 5,000 tons of cargo and almost 11,000 personnel. This air-bridge was maintained, albeit at a much lower intensity, until the surrender of the Argentine garrison on 14 June. If the mainland air forces were experiencing a number of problems, what of the Argentine air garrison on the Falklands? Here too, Argentina’s numerical strength was not going to pay dividends. The climate and conditions in the Falklands did not suit many of the aircraft and their serviceability began to suffer as the campaign drew on. Argentine aircraft were not used to operating in these conditions nor in fact from their southernmost bases for extended periods during winter months. They were normally based further north in milder conditions. Perhaps of more danger to the garrison’s aircraft was British offensive activity, which took its toll on many of the aircraft. Special forces raids, such as the attack against Argentine aircraft at Pebble Island on the night of 14 May, naval gunfire against Goose Green and Stanley, and British air attacks on the capital’s airfield all combined to reduce severely the number of available Argentine machines. Additionally, a number of garrison machines fell victim to air-to-air engagements, accidents, British surface-to-air missiles and Argentine friendly ground fire. On the whole Argentina’s Falklands air garrison did not pose a significant threat, although it certainly had the potential. Stocks of air weaponry were large, the pilots’ training was generally high and at times the weather perfect and yet very few missions were launched against the ships in San Carlos and the land forces. Any major attacks would have augmented the mainland assault and split British defences, increasing Argentine success and damaging further British efforts. The reasons for this must, for now, be left to speculation. On the other hand, the mobility afforded by a not insubstantial force of helicopters was put to good use in re-supply and general support, particularly towards the end of the campaign, with their remaining helicopters often flying in conditions for which neither their equipment nor training could have prepared them. At the start of the occupation the Argentinians had considered basing more capable machines in the Falklands. However, following tests with a CANA Skyhawk at Stanley airfield, it was demonstrated that the existing runway was impractical and unsafe for heavily laden modern attack aircraft until adequately extended. This left the combat element of the Falklands garrison as 25 Pucaras of the FAA and ten AM339s and Mentors of the CANA. The British did not have the same worries concerning the length of their runways. The pitching, heaving and almost continual sea spray covering them seemed of more importance. The overwhelming bulk of Britain’s air missions were flown from the decks of the Task Force, and principally the two carriers, Invincible and Hermes. The conflict demonstrated the inherent characteristics of aircraft carriers and their vital role in supporting foreign policy beyond a nation’s coastline. However, other flight decks would also be utilised on a variety of naval vessels, improvised merchantmen and also from a forward operating strip overlooking San Carlos, HMS Sheathbill, which was in operation towards the end of the campaign. The centrepiece of the Task Force’s defensive and offensive capability centred on the Sea Harrier. Harrier aviation was not new. Both the RAF and United States Marine Corps (USMC) had been successfully operating the Harrier for over a decade. What was new was the situation. No Harrier had ever gone to war before, certainly and not least gone to war on the back of ships, and certainly not in the role of fighter, ground attack and reconnaissance platform. Outnumbered, although perhaps not as greatly as many have believed, the Harrier was to be the key to retaking the Falklands. This novel British aircraft would lead the vanguard of Britain’s air strength in the South Atlantic. One of the major problems affecting the Sea Harrier, and all aspects of the British air war, was quantity. Only 20 examples would sail to begin with and, though they would be joined by further Sea Harriers during the campaign and an additional 14 Harrier GR3s of the RAF, lack of numbers continued to be a key aspect in the effort. Yet the RN Sea Harriers were to perform over 1,200 sorties and the RAF machines a further 150. 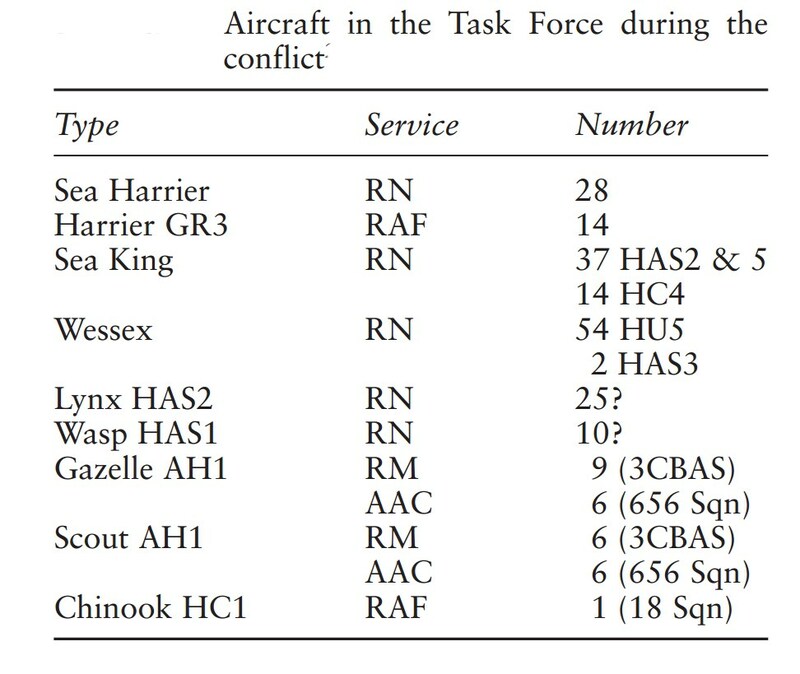 Losses were remarkably few with only six Sea Harriers and four RAF Harriers being lost, of which two Sea Harriers and three Harrier GR3s were victims of Argentine ground fire. The other machines were lost through accidents and weather-related incidents. None of the Harriers was lost in air-to-air engagements. Sea Harriers accounted for 23 enemy aircraft, 20 resulting from the use of Sidewinders. Contrary to popular belief, the majority of these were `tailpipe’ shots thus not exploiting the better engagement capabilities of the improved Sidewinders delivered from the Americans, and far superior to those of the Argentines or even existing British missiles. The Harriers also carried out anti-shipping strikes and combat air support (CAS). Initially the CAS role carried out by Sea Harriers but during the conflict the RAF Harrier GR3, specialised in ground attack, would replace the Sea Harriers in the `mud-moving’ capacity, freeing up valuable air defence aircraft for protection of the fleet. However, there were other problems. The lack of range of the Harriers would impact on transit and on-station times, as the British carrier group was forced to remain at a distance from potential air attack. This was made dramatically worse by the lack of a crucial element in any modern air war – AEW. This forced a higher number of Sea Harrier sorties for air defence of the fleet, gave less warning time and saw a number of ships hit by Argentinian aircraft which might otherwise have evaded damage. Nonetheless, the Sea Harriers performed beyond the expectations of all bar those who really knew the aircraft, even in the area of availability. This was extremely high and amazingly only one sortie was cancelled through unavailability. This is all the more remarkable considering the conditions in which the aircraft were being operated and maintained. It can be seen that the combination of the Sea Harrier’s presence and Argentina’s own problems with providing air defence assets over the Falklands enabled the air umbrella to be much stronger than many expected. 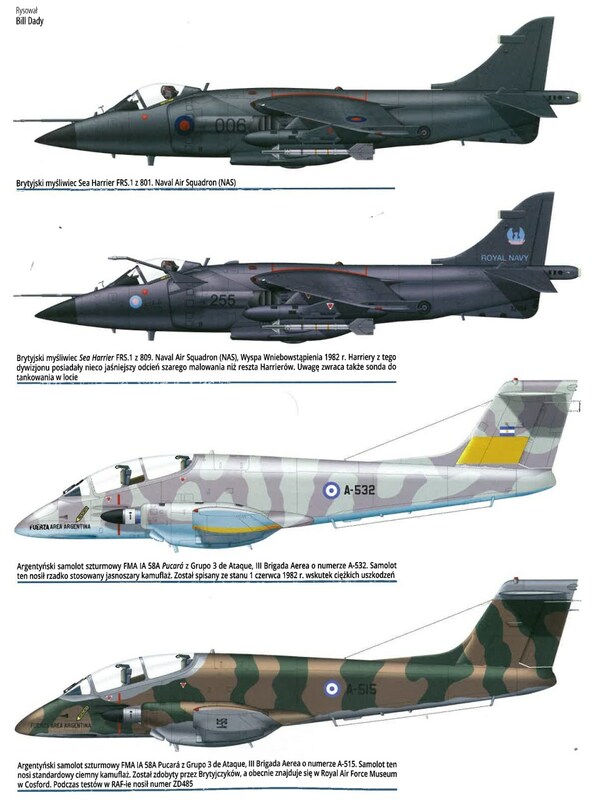 However, the Sea Harrier and Harrier GR3s, although vital in the successful prosecution of the war, were only one part of the in-theatre aviation assets available to the Task Force. This can be seen where the Harriers formed part of a much bigger air fleet composed mostly of helicopters with over 150 from all services.